AddressLabels is an iOS app) for managing card or mailing lists e.g. 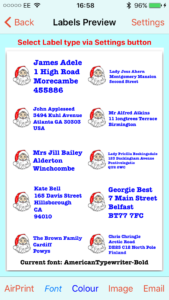 Christmas card lists and printing address labels. It has the following useful features. Create numerous card or mailing lists. 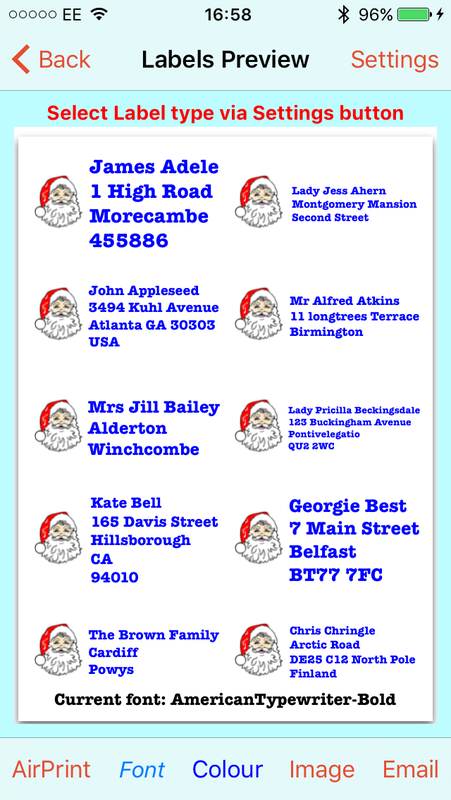 Print Names and Addresses to Label sheets e.g. Avery – What a time saver! Add names manually or select from your Contacts. Backup and Restore via a Dropbox account – even to a different device. Transfer lists to AddressLabels for Mac, via Dropbox facility. Change Label font and Color. Easily make a record of cards written, mailed and received. Mark cards as hand-delivered or eCards. List view shows number of stamps still required. Add extra useful information to a name e.g. names of Children. Create an alias for a card for mailing e.g. Robinson family.